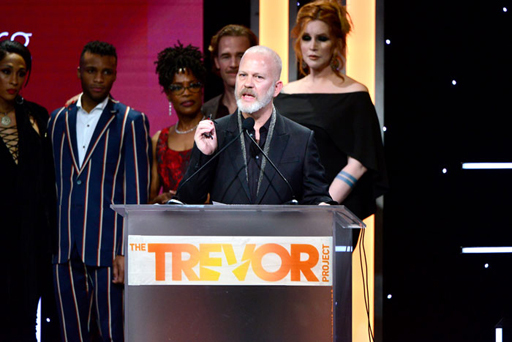 Out producer/director/writer Ryan Murphy announced at The Trevor Project’s annual gala on Sunday night that he is on a mission to vote out of office anti-LGBTQ lawmakers. Janet Mock presented the Hero Award to Ryan Murphy and the cast of POSE. Murphy also told the audience he will launch a multi-million dollar initiative in 2020, “Pose Gives Back,” to target those legislators in Congress who work against the rights of LGBTQ Americans, according to Variety. Noting the results of this year’s midterm elections which saw over 20 anti-LGBTQ politicians defeated in a single night, Murphy says he felt inspired. According to Murphy, “Pose Gives Back” will provide financial support to at least 20 pro-LGBTQ candidates in 2020 in conjunction with corporate sponsors. He ended his speech announcing a $50,000 donation to The Trevor Project. You can watch Murphy’s acceptance speech and announcement below from The Trevor Project’s livestream below. Trans activist/writer Janet Mock introduces Murphy at the 124:00 mark. 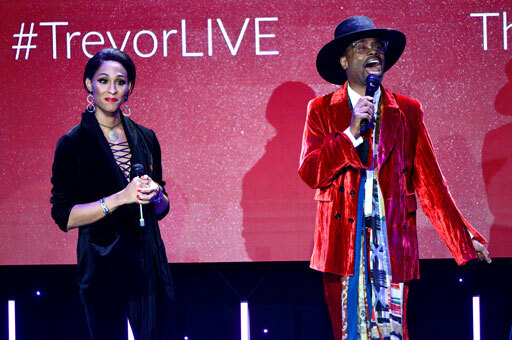 The gala evening raised over $1.5 million Sunday night for The Trevor Project's mission to help LGBTQ teens in crisis. On a lighter note, Pose stars MJ Rodriguez and Billy Porter thrilled the gala audience with a reprise of their duet of “Home” from The Wiz. Watch below.